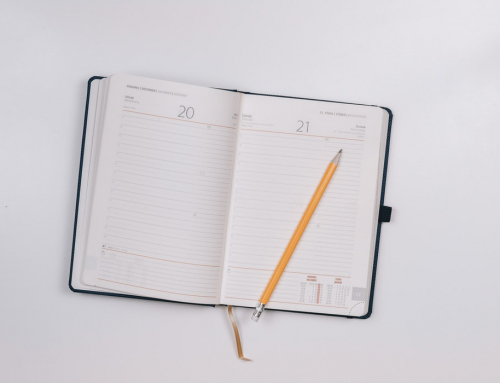 I came to China with the determined, eager mindset of “I want to teach because it’s my passion, but I also want to travel, see and experience as much as possible!” It was this very mindset that drove me to take advantage of my generous timetable whereby I work just eight hours a week, with Friday’s off as well as Monday mornings. I dedicated my whole day, on Friday 25th of September 2015, to a nine hour train journey to Anhui Province, Tongling. 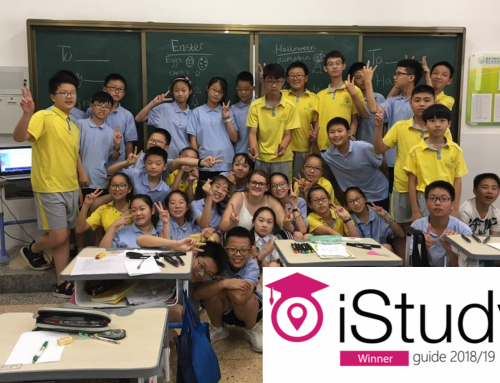 I would visit my fellow Teach English In China friend Nicolle, and spend an evening in Tongling, her home, before we both embarked on our Huangshan Mountain’s journey early the next morning. The train journey itself deserves a remark. I chose to keep in budget and so rather than ride in luxury on the bullet train; I booked the cheapest train and had a “hard seat”. This being China, once I got my tickets (which I had booked on C-Trip English – great website) I realised they had overbooked and I in fact didn’t have a seat at all, not even a hard seat (which is very literally… hard)! Luckily, on the way back I did have a seat number. I say luckily because I would be getting the train back very late Sunday night arriving very early Monday morning, basically having my Sunday night’s sleep on the train – a seat at least was crucial for that! Anyway, though I didn’t technically have a seat, this wise-looking, Chinese man, who I genuinely (I will never judge again) would never have guessed would have SUCH amazing English, turned to me and said “Sit there!” I informed him that I did not have a seat, and he responded “Never mind! Sit down!” This promised me a seat for a bulk of the journey, however the last two hours I was standing. Nevertheless, I made friends with the welcoming Chinese people around me. It was a very cosy, tight squeeze so you kind of have to get friendly with people. An old Chinese couple helped me get the hot water for my noodle box (which is a very popular thing to eat on the train by the way). It’s similar to pot noodle but bigger, more flavoursome and Chinese. Ultimately, though I was more than likely the only “foreigner” on that train, I felt so happy, at peace, welcomed and excited for the incredible weekend I had ahead of me! Upon arrival to Tongling train station, I was amazed. In the distance, I could see mountains. I felt like I was in another country, not just another part of China! It was such a change to the busy city life I have in Shanghai. I met Nicolle in excitement, and she proceeded to take me to an amazing restaurant for a steak dinner! It was nice to have a slight taste of home. She also showed me around Tongling. A memory I won’t forget is the evening views this amazing huge park in Tongling contained. It was the Mid-Autumn Festival weekend, and so we presumed this was why many people were lighting lanterns into the sky. It was a beautiful moment in which I absorbed the views and surroundings around me, and smiled thinking “Sabrina you are in China!” I find that I often have to remind myself that this whole teaching English in China experience is not a dream, but a reality I am living. Anyway, following a lovely evening in Tongling we stocked up on food and supplies for the mountain, and got an early nights rest as it would be an early start to get the bus to Tangkou in the morning. Tangkou was the place in which the bus station for all buses going up to Huangshan Mountains departed from. We, (just about! ), got the bus to Tangkou and it was very simple to book the scenic bus up the mountain to our hotel, the Hot Springs Hotel. We arrived into Huangshan at around midday, and WOW it was beautifully amazing. The scenic bus was definitely scenic, picturesque and also slightly scary as we drove very close to the edge in excitement and fear! We got dropped off at our hotel, and checked in by 1pm. Words cannot describe the beauty of where we were, our natural, gorgeous surroundings and how luxurious the hotel was! Nicolle and I had got a great price for it as well; the hotel including the hot springs was around £40 which is certainly a bargain in England! Later on that day, we found out just how spectacular those hot springs were. So after freshening up, breathing in the invigorating FRESH air (such a contrast to the smog of Shanghai), we left our extravagant hotel room and got the free bus over to the hot springs, which was a very short 4 minute drive across the mountain. Now when I say WOW, I mean WOW. Nicolle and I had picked the best weekend to come to the mountains, it wasn’t a busy holiday (it was the weekend before the national holiday week) and the weather was great! It was hot and there were clear blue skies. Before boarding the bus, it was now lunchtime and we were hungry and as food availability around us was limited we ate what can only be described as frozen, sealed chicken. I see lots of people eating it around China; it was desperate measures and tasted better than it looked! So Nicolle and I spent the whole day and evening relaxing in the hot springs before our hike up the Huangshan Mountain early the next morning. The hot springs were simply remarkable, so many relaxing spots, flavours, various aromas, oils and colours. It was like walking into paradise. 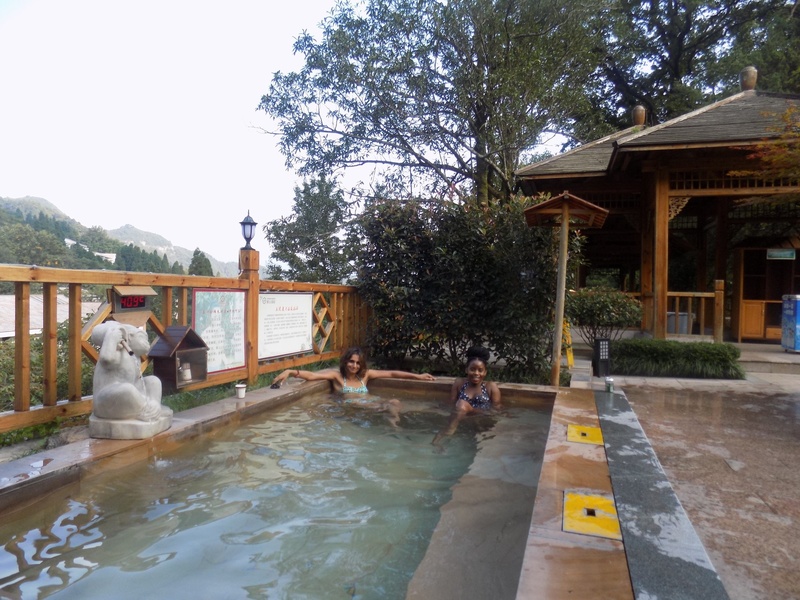 There were various hot springs, like hot tubs, that had the temperature labelled on them – varying from 30-45degrees Celsius. The hot springs were amongst beautiful trees, flowers, natural and peaceful surroundings. Even in a whole day and evening, we did not get through all of the springs! This clearly emphasises the variety. 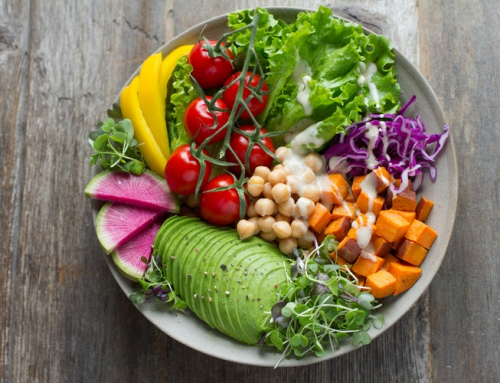 I would definitely recommend the hotel; it had free green tea available, free fruit and cake in its restaurant, cheap grilled food, and also a spa available for massages and treatment. The changing rooms and shower area also had a sauna; however Nicolle and I did not get a chance to use this nice facility. By the evening, we had made friends with a group of German guys who had come to the Hot Springs following their hike around the Yellow Mountains! They probably deserved the soak more than we did! We explored various springs together and also played some Chinese checkers whilst enjoying the green tea available in the centre of the springs. 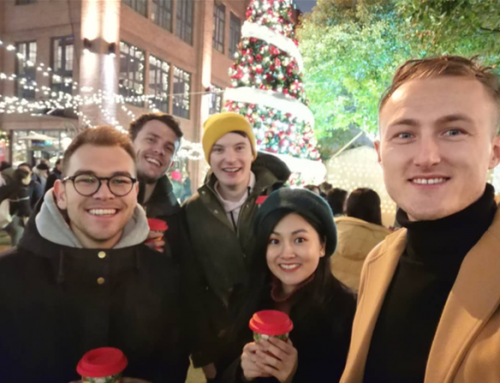 It was at this point, that I was amazed that China had become such an almost small world for me now, as even though I was so many miles away from home I found that these German friends were from Shanghai too, studying at Jiading University. We had a fun evening and I still see and keep in touch with them now! 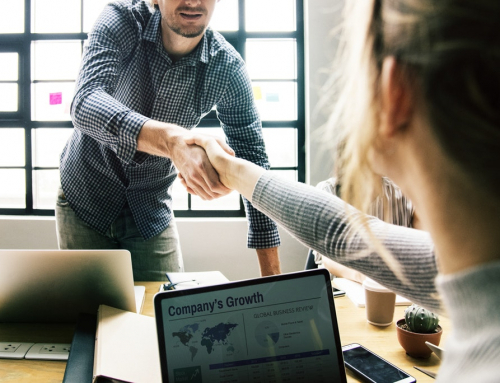 That’s the beauty of travelling and the whole Teach English In China experience, you meet and make like-minded friends with people all over the world, and you do keep in touch! After a decent night’s sleep (I say decent because Nicolle and I struggled to sleep immediately in excitement for the next day), I woke up to a beautiful view of the sun shining and the natural view of trees at the window. I remember comparing it to Twilight, Robert Patterson’s home in the forest. The bus driving up the mountain to the cable carts would leave at 7am from our hotel, so we got up early and had breakfast at 6:30am. The breakfast was amazing, as was the hotel, and consisted of toast, eggs, tea, orange juice, noodles, dumplings, sausages, fruit and various other scrumptious Chinese and English foods. The bus, costing roughly 20RMB which is about £2 took us higher up the mountain and dropped us to the cable carts and entrance to the Huangshan Mountain. It was at this point, whilst we queued to buy tickets that China became smaller to me again, as in the queue I bumped into a family who coincidentally were also teaching in Shanghai, Xuijing, and living in the same compound (Green Villa) as me! Considering Shanghai is around a 10 hour train journey away from where we were, and Xuijing is a quiet suburb – I found this remarkable! We bumped into them quite a few times whilst trekking the mountain. Anyway, my word of advice would be to bring your student card to China – even if it’s expired! I didn’t have mine; however Nicolle did, so her ticket was roughly 200RMB cheaper than mine! 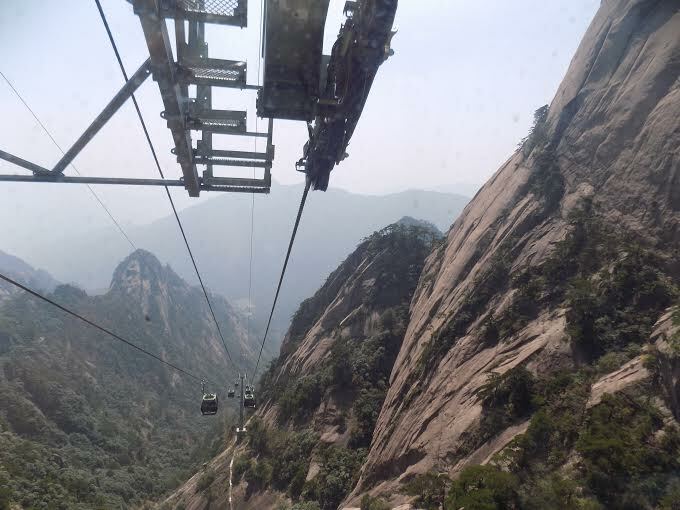 The cable cart ticket and entrance to the mountain altogether was around 300RMB without a student card, which is £30. The cable cart journey up the mountain was phenomenal. This thrill took over my body whilst we went higher and higher up the mountain, the views were breathtaking. My photos don’t do any of this any justice! We took the cable cart going up from Cloud Valley Station and got dropped off at White Goose Ridge Station. This was the start of our hike and exploration of all the various, beautiful peaks of the Huangshan Mountains. We began walking, and it was unbelievably sunny and hot. I was quite honestly overwhelmed by the constant, astonishing, breathtaking views of the Huangshan Mountains. The beauty of Mt. 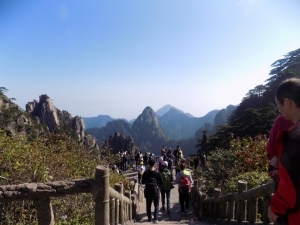 Huangshan is that there are various different peaks to explore, not just one big peak at the top, such as the Stalagmite Peak, Black Tiger Peak, Dawn Peak, Cooling Peak, Lotus Peak and the Brightness Top. These are just to name a few of the peaks Nicolle and I explored. They all had their own beauty and as you walk you find you have explored so many mesmerising sights. My advice to us is to buy a map, but also just “go with the flow”. 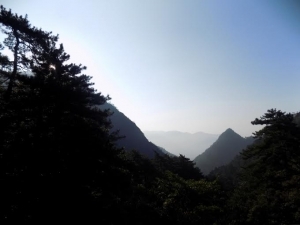 Huangshan is so large, with so many hidden gems; you can explore at your own pace and see so much naturally. The Brightness Top was particularly amazing for me. We could see in the distance the mountains we had just been up and explored, and looking at it from the other side was astonishing. After embracing this view, we headed to the flying rock which was one of my favourite views. We hiked up many small, strenuous steps but any pain was taken away by the astonishing sights on the flying rock. Nicolle and I, excitedly, took many photos and sat down here to have a fruit break. At this point, the only main part of the mountain we had left was the Grand Canyon. We had explored a large part of the Huangshan Mountains in a couple of hours. Our legs were definitely going to ache the next day… but it was worth it! Each climb and trek, was tiring and exhausting but then that feeling of reaching the top removed all of that and made it more than worth it. I felt like I was on top of the world in the clouds when I stared at the mountainous, magical view that lay before me. It reminded me that in life everything worthwhile, beautiful, and extraordinary is achieved after hard work and commitment. It’s always worth the climb! The journey back towards the cable cart station, named Jade Screen Station, was phenomenal. It was like a whole new scenic route around the mountains walking through narrow, rocky tunnels and plenty of steps. At one point I looked up and had the sun scorching down on me and pretty much saw billions of steps going into the sky. Just making it up them was a massive achievement. I rightfully granted myself a few cheeky weeks off from my mixed martial arts class after my Huangshan Mountain weekend. We finally made it to the cable cart station around 2pm and I felt this sadness inside me to be leaving. The beauty of the Huangshan Mountains is that I feel that you can go a million times, but never take the same route and see EVERY view. I already planned to return as I did not get to explore the Grand Canyon due to a time limit in getting the last bus from Tangkou to Tongling. Also, it was genuinely an amazing and affordable trip. It has inspired me to climb even more and bigger mountains around China, and ultimately the rest of the world. We arrived into Tangkou and caught the bus to Tongling with plenty of time. We got down earlier as we were warned the last bus to Tongling was around 3pm, and a taxi to Tongling would have been extortionate. 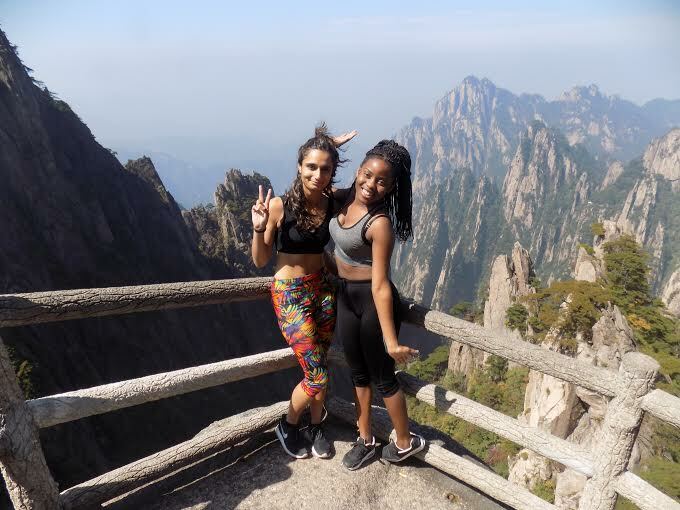 Even so, we had explored, embraced and loved our Huangshan adventure. It was a refreshing, revitalising, de-stressing and spiritual experience for me. I felt like I had stepped out of a busy, city life in Shanghai into pure nature in the mountains, with no smog, no pollution and no craziness. It was calming, relaxing and made me feel like a new person. 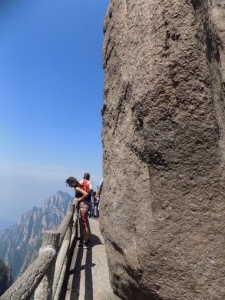 It’s difficult for me to explain the feeling; I guess you need to go to Huangshan yourself to experience it!